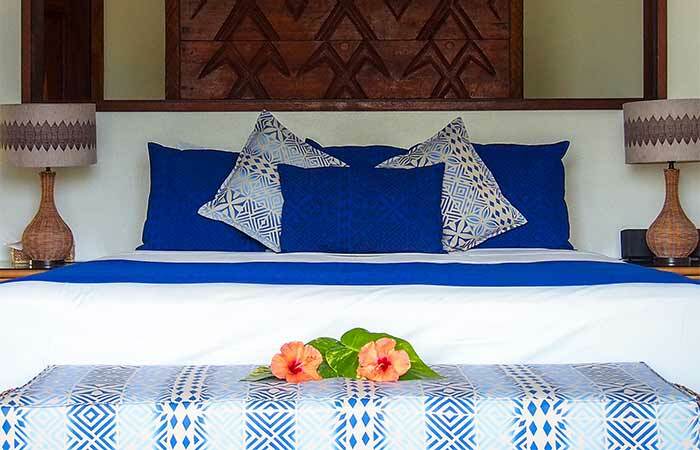 Sinalei is a locally owned Boutique Resort nestled within a sheltered lagoon along the Southern coast of Upolu Island, a mere stones throw from Apia and Faleolo International Airport. 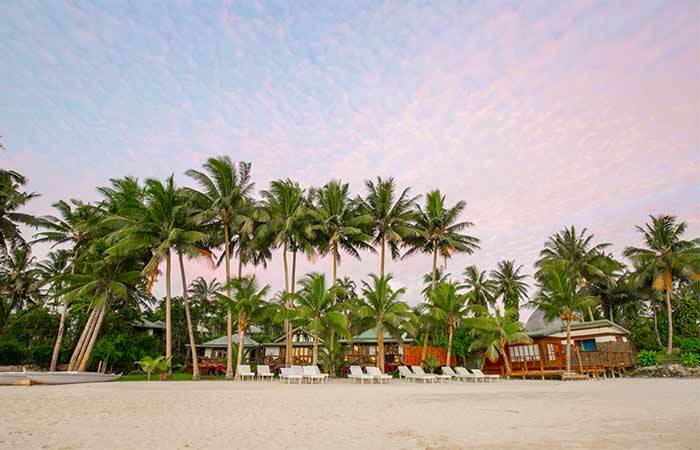 This remote Resort is spread across 33 elegantly groomed acres of lush vegetation, creating an atmosphere of modern-rustic luxury combined with raw untouched beauty. Enjoy your sun kissed days and star filled nights in the beauty that is Sinalei. Sinalei is an untouched and delicately preserved island paradise boasting 29 stylishly-designed villas. Home to secluded balmy beaches, clear blue waters, and an abundance of surf; Sinalei welcomes all, including adult families (children over 12). Indulging those who wish to unplug from their hectic lives, their remote resort strives to spoil you with luxurious touches and personal experiences. 5-star dining, waterfront spa, signature activities and specialized event co-coordinators are just some of the luxurious provisions available to you. Sinalei is more than just a boutique resort. When you visit them, you visit the people of Samoa. You visit those who make up the villages of this great island home. You visit family. You go to Samoa to experience the South Pacific as it was 100 years ago. The waves are raw, uncrowded, and offer an experience unlike anywhere else on Earth. Sinalei Reef Resort and Spa has partnered with Manoa Surf Tours to offer guided surf transfers for only $40 USD per session. You can stay at a beautiful resort that doesn’t break the bank and go surf 1-2 times a day while your family enjoys other activities. Sinalei has something for everyone! Faleolo International Airport, located on the main island of Upolu Samoa, will be your first point of call when visiting our pristine shores. The air station is serviced by commercial Airlines including Air New Zealand, Virgin Samoa and Fiji Airways. 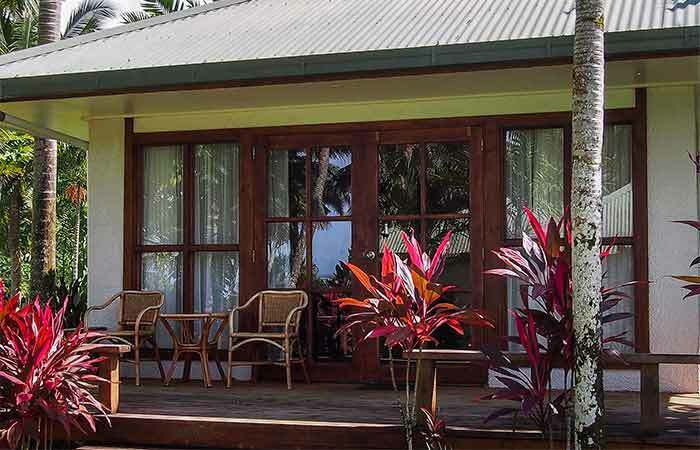 Sinalei Reef Resort & Spa is a mere 45 minute drive from Faleolo International Airport and an even closer 20 minute cruise over from the capital city Apia. Getting there is simple. Either book a transfer direct with their reservations team or simply book your stay for a minimum of 5 nights and enjoy a free ride on the house. Ruggedly Luxurious with its picturesque backdrop, a destination for the global jetsetter. Considered the heart of Polynesia, Samoa has a 3000 year-old way of life called Fa’a Samoa that offers the most memorable escape. A place that allows you to be still, when the rest of the world is spinning around you. An island nation so peaceful and relaxed, it allows you to rest, rejuvenate and rebuild. Samoa is a postcard of natural beauty consisting of ten islands, each offering very distinct and different environments to explore. Blessed with stunning land and seascapes, and friendly people who are proud of their country, there are many versions of paradise to discover. Explore Samoa’s lush green fertile valleys where banyan trees tower above the tropical rainforest canopy. Take time to cool down at a watering hole next to one of Samoa’s many cascading waterfalls that drop into rivers cutting jagged lines through the valley floor as they make their way to the ocean. The coastline is a wonder in itself, with sparkling white sand beaches, in some places stretching for miles, and here and there are walls of sheer cliffs that drop straight into the Pacific waters. Beyond the beaches out into the blue lagoons are scattered the rest of the islands that make up the Samoa archipelago, some inhabited, others with only wildlife, protected by the fringing coral reef that keep the powerful force of the Pacific Ocean at bay. And amongst all this natural beauty and picturesque valleys and coastline you will find nu’u or villages with their churches, meeting houses and open fales or homes encircling the malae or village green. Home to people proud of their strong Fa’a Samoa cultural heritage that live alongside these natural wonders. For it’s the people, culture and nature that give life to these islands. Our beautiful island home. 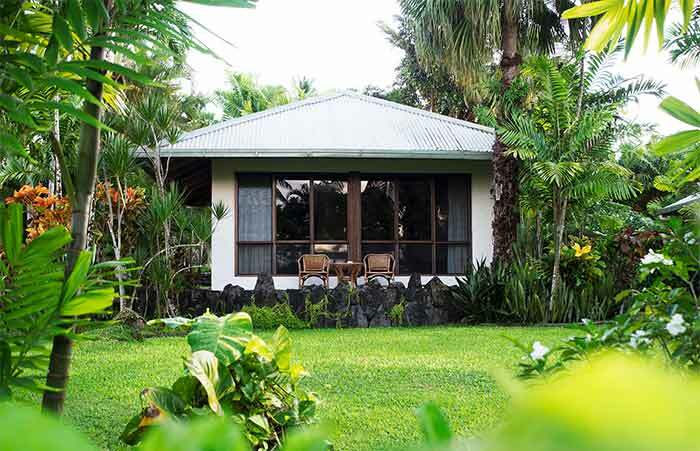 Inspired by the raw beauty of Samoa, the villas are lovingly nestled into the natural fauna of the Resort, allowing you a unique look-in on your breathtaking surrounds. Elegant European décor and individual pieces of Samoan fine art combine to spoil you with an atmosphere of modern-rustic luxury and raw untouched beauty. Sanctuary mattresses, crisp cotton linen, a complimentary fruit basket and welcome cocktail upon arrival, are only some of the niceties that await your stay at Sinalei. 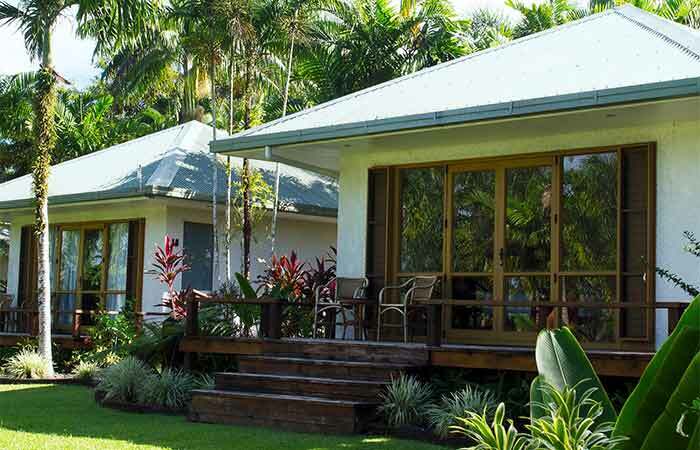 Enveloping the spirit of Samoa, Sinalei’s nostalgic Traditional Villas are nestled amongst lush tropical grounds. Embodying authentic Samoan charm, these villas offer the ultimate in island experience, fused with a chic twist on tradition. The gorgeous Garden View Villas, dotted amongst the swaying palms, are designed for those wanting to experience light filled chic villas nestled amongst cascading gardens. Wake up amongst the natural foliage of Sinalei, as the sun seeps through your windows, inviting you to enjoy its wonder for the day. Nestled amongst immaculate gardens, with views over the sparkling aqua lagoon, our Ocean View Villas are one step closer to the soft white sands of the sea. Listen to the sound of the waves as you wake each morning, watch the ocean twist from azure turquoise to deep blue as the sun wraps its way over the palms by night. 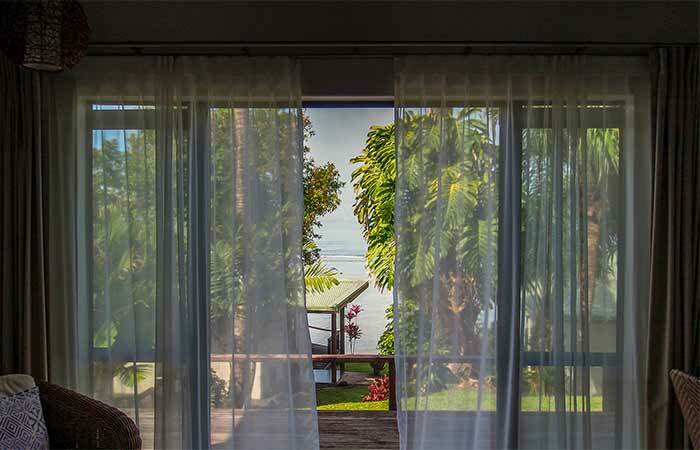 The One Bedroom Ocean View Villas are designed to bring the best of your surrounds to you. Modern rustic luxury interiors, boasting either dual sleeping areas or a stunning spacious nook to enjoy your morning routine. With stylish finishes throughout, each villa boasts a beautifully expansive deck fringed with fanning palms. Displayed beautifully on our beachfront, these villas are designed specifically with couples in mind, featuring large decks over the waters’ edge, and sun loungers looking out to the horizon. 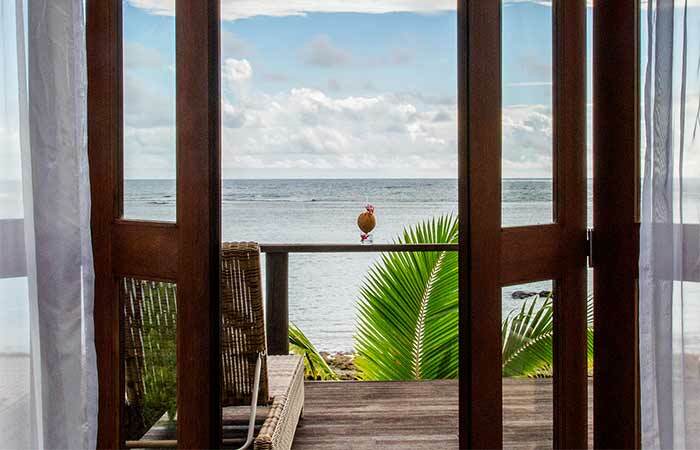 These eco-chic island abodes really are the most stylish and romantic villas Samoa has to offer, encouraging breakfast in bed with views over the turquoise waters. Strolling the pristine sands and jungle greenery of our grounds, you will stumble across this Robinson Crusoe style Villa splayed beachfront of the idyllic Sinalei bay. With its natural bounty and stunningly rustic style, you and your loved ones can relish the island vibes as you laze beneath the swaying palms on your beachfront deck. For when nothing but the best will do. 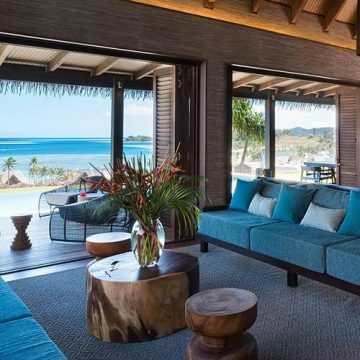 Positioned perfectly with panoramic views across the stunning white sands and turquoise lagoon, this residence comprises of 3 standalone villas. Designed for experience lovers, they invite you to see the true Samoa through Sinalei. Treat yourself to an authentic 5-star dining experience or revel in the delights of overwater therapy. Do as much or as little as you like, where the former could involve a snooze in the sun and the latter a journey through the Fa’a Samoa (Samoan way of life). Lead your very own escapade across dry and wet terrain and enjoy the spoils of Mother Nature with the help of our carefully crafted signature experiences and tours. Local voltage is 220 to 240 volts AC. In Samoa (formerly Western Samoa), an archipelago in the Pacific Ocean located south of the equator, the climate is tropical, that is, hot, humid and rainy throughout the year, with a maximum in rainfall from December to March, and a relative minimum from June to September. 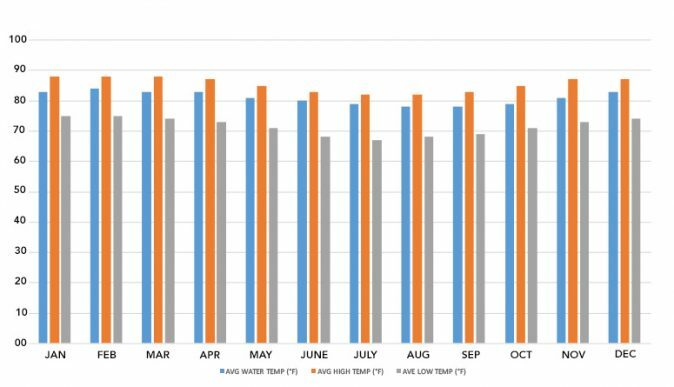 Temperatures are stable and vary little between the hottest period (December to April), when highs are about 30 °C (86 °F), and the coolest period (June to September) when they are around 29 °C (84 °F). Temperatures at night are almost always above 20 °C (68 °F). 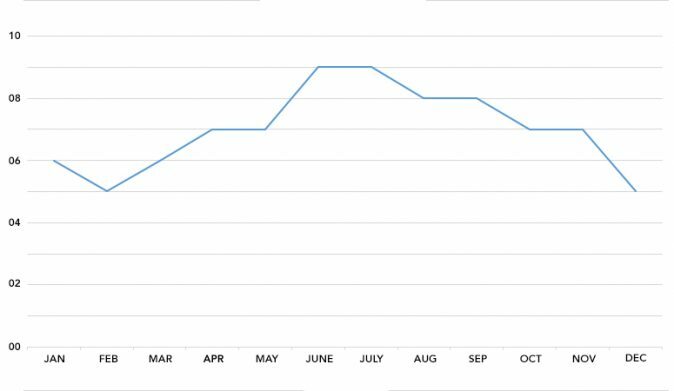 The south-east trade winds blow steadily throughout the year, making the heat more bearable. Here are the average temperatures of Apia. The rains fall in the form of downpour or thunderstorm, intense but usually short-lived, except in the period from December to March, when they can sometimes last for several hours. 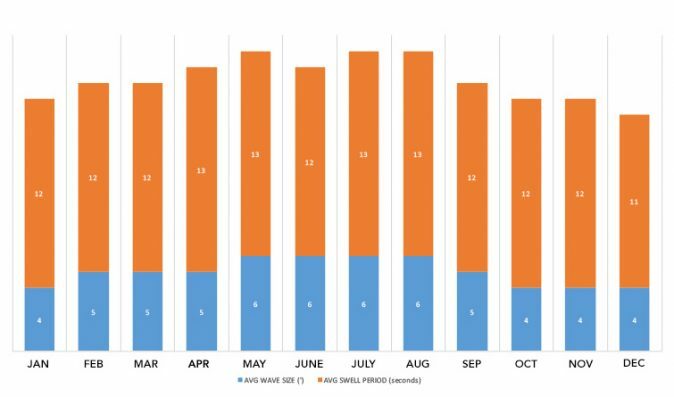 The best time to travel to Samoa goes from June to September, being the least hot and the least rainy; however, even in this period, some downpours and thunderstorms must be put into account. Allow us to take you on a journey. A lantern lit path through the heart and soul of Sinalei, as the sounds of ukulele and pristine ocean waters lap against our palm fringed shore. Whilst the smiles of our Sinalei family melt not only your heart, but the yearning to be anywhere else but here. We are Sinalei, a Samoan owned resort steeped in culture and soul so immeasurable that our guests leave with no desire but to return. You see, it is true that we are an icon of our island home, a utopia where beach marries rainforest, and lovingly appointed villas nestle amongst our lush tropical surrounds. But we are so much more than what treats the eye. We are a love story featuring the surrounding villages and starring the people of our Sinalei community. But to truly understand who we are, we must first tell the tale of where we come from. The story of our land begins far before the birth of our resort. Dating back to the days of Malietoa (The Samoan King), Le Ufi Sa was considered a place where the King and his warriors would come and feast on the sacred yams that grew wild. As the tale goes, they believed the yams gave them special powers that would prepare them for adversaries that threatened their precious islands. Some 200 years on, this sacred ground would continue to serve as a source of empowerment as a young Samoan merchant with a dream to free his beloved nation from foreign rule began his fight for Samoa’s independence. This young man was the grandfather of Tuatagaloa Joe Annandale, the co-owner and founder of Sinalei. As history has a habit of repeating itself, Joe and his wife Tui, who was tragically lost in the 2009 Tsunami, would in 1994 draw on the mystical properties of this land, to begin a fight of their own. A fight to honour the good works of their forefathers. A fight to realise a dream against all odds. A fight to create Sinalei. With little more than a vision of a small mom and pop retreat, Joe and Tui went to work on the land. For two long years they lived in an open fale on the property with no gas, no running water, an open fire for cooking, simply living off the land. Every day inching closer to their dream of a tropical themed escape. Fueled by a yearning to pay homage to their Samoan heritage and inspired by memories of plantation life, Joe and Tui would finally open Sinalei’s local and picturesque doors in 1996. From its humble beginnings, a dream held by this loving pair of a few shacks along the beach has evolved into 29 beautiful abodes. A dream no longer theirs alone but one that is shared by family and community alike. A dream brought to life by the people of the villages who have stood by the resort through thick thin. Through cyclones, tsunamis and personal hardship, Sinalei and the people that make this special place, stand as one. So when you visit with us, you visit the people of Samoa. You visit the people who make up the villages of our great island home. You visit family. To this day, our sacred land and family continue to empower Sinalei for the battles at hand, constantly evolving our beautiful story. Our hope is that when you visit Sinalei, the healing powers of our shores and kindness of our people, relax, rejuvenate and prepare you, for your very own endeavors. That when you visit, you become a part of our story, as much as we become a part of yours. Along Upolu’s South Coast and directly in front of the Resort, some of Samoa’s best surf breaks challenge surfers from all over the world. A fast-emerging surfing destination, yet still relatively undiscovered, Samoa’s surf spots are rarely crowded. At Sinalei you get front row access to the best of their local breaks through our preferred surf excursion partner (Manoa Tours Samoa), whose operation is set-up within walking distance of the resort. With their knowledge of local conditions, currents, wind and waves, you will find yourself in the best hands possible. Proximity of breaks to Sinalei Reef Resort often means you’re the first in the water and last to leave. Nuusafee Island (An unforgettable left hander that wraps around a nearby deserted island).